A Grand Heritage Palace of the HRH Group, Jagmandir is a historic 17th century palace redeveloped as a complete destination: with its all-day café, stylish-dining restaurant, bar and spa designed to uplift moods and spirits. The picturesque Jagmandir today plays host to 21st century guests. Corporate and leisure travellers, celebrities from all over the world for whom ceremonial parties and mega-events are seamlessly organized. Year after year, Jagmandir continues to make news in the global glamour world for the exclusive ‘regal experiences’ it offers. 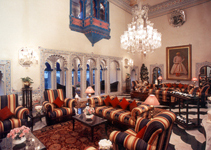 Guests are ferried to Jagmandir, the palace synonymous with a defining episode of history when the Mughal Prince Khurram sought refuge here in 1623. His stay at the Gol Mahal inspired him, as Mughal Emperor Shah Jehan, to build the Taj Mahal in Agra. At the colonnaded Darikhana Restaurant, Picholi Bar and all-day café you can leisurely spend hours gazing across Lake Pichola and the City Palace complex. For history-lovers there’s Jagriti, a heritage museum onsite to give a fill on how Jagmandir was built and developed over the centuries. Jagmandir is often referred to as a swarg ki vatika or garden of heaven. When cocktails, theme-dinners, banquets and wedding ceremonies are organized here, the flowers and special lighting, folk dancers and fireworks bring alive this garden of heaven in vibrant colours of celebrations. Musical soirees and performances at the Garden Courtyard, wedding ceremonies at Kunwarpada Chowk, lavish buffets or sit-down banquets at Kunwarpada Lawns… Jagmandir has dedicated heritage venues that challenge your creativity in pampering your guests. At The Panghat Spa and Salon, it’s the body-mind-and-soul that is pampered; yoga and meditation classes are conducted for those seeking quests beyond the material. Jagmandir, with its special place in history. The Darikhana restaurant is an exclusive venue for stylish dining. 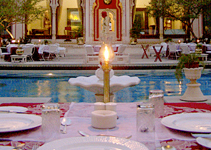 It’s a colonnaded restaurant, specially air-conditioned for guests, and offers an select international cuisine. A varied a la carte menu is offered for evening dining. We also serve a specially prepared four-course dinner, which is highly recommended. The Barah Pathoron ka Mahal, or the Palace of Twelve Stones, is where the Picholi Bar is now housed. 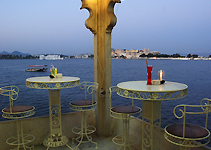 The bar derives its name from the oldest settlement on the banks of Lake Pichola, the Picholi village. Guests can enjoy a leisurely drink of wine or beer and soak in the commanding view of the City Palace Complex and Lake Pichola from this historic venue. 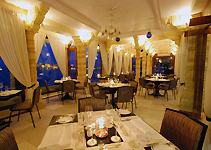 Consistently rated as one of the top restaurants of India, the Sunset Terrace offers dramatic views of Udaipur's most famous landmark palaces. The open-to-sky restaurant offers a varied menu to choose from while taking in the magnificent natural scenery. Live musicians add to the magic. 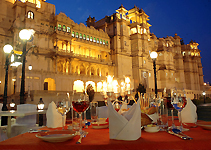 At Surya Darshan Bar,Fateh Prakash Palace , you'd love the English Afternoon Tea service. You could sit back here with a drink and watch the sun set over the hills ringing Lake Pichola. Truly a picturesque sight! Paantya, (a Mewari word meaning ‘sitting in line, in protocol’) is the multi-cuisine restaurant, adorned with original paintings of the Mewar School, gold latticework and antique chandeliers. Due to the Palace Complex’s undulating topography, the restaurant is elevated and provides a magnificent view of the city. 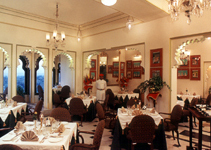 The Paantya offers a selection of Continental, Mughlai, and authentic Rajasthani cuisine. A candlelit dinner at the Pool Deck, with soft strains of light instrumental music, makes for the timeless perfect evening with your loved one. During the day, a variety of snacks and drinks can also be enjoyed at the poolside. Timings: 11am to 10.30 pm. Panera bar, with its authentic décor of glass inlay work, huge chandeliers and ornate mirrors, offers a wide selection of snacks and drinks, and is by The Pool Deck. The name ‘Panera’ is derived from paani or water, and refers to the storehouse for water and liquor in the royal household. 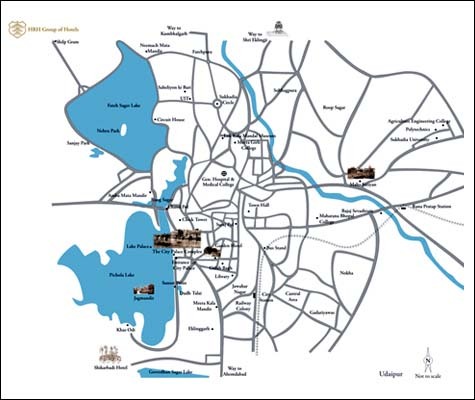 After a long walk through the City Palace Museum, refresh yourself at the Palki Khana or the Pavilion for Palanquins at Manek Chowk. This European-style café offers a relaxed and informal ambience. The coffee bar and heritage liqueurs are highly recommended. 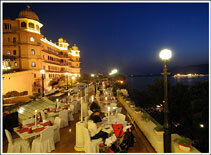 Relish a sumptuous meal at a special price, packaged with the Mewar Sound and Light Show.